1. Preheat the oven to 150ºC, gas mark 3. Arrange the tomato halves in a single layer on a baking sheet lined with non-stick baking parchment. Cook in the oven for about 1 hour, then remove and set aside. 2. Whisk the mustard and vinegar together in a bowl, add the sugar and garlic and slowly whisk in the 50ml oil until emulsified and thick. Season to taste. 3. Heat a griddle to hot. Brush the asparagus with the remaining oil, season and then griddle for 3-5 minutes until charred and tender. 4. 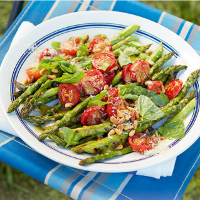 Arrange the cooked asparagus on a large serving plate, scatter with the tomatoes, drizzle generously with the dressing and then top with pine nuts, basil leaves and the cheese. Serve immediately. Delicious with griddled or barbecued chicken.